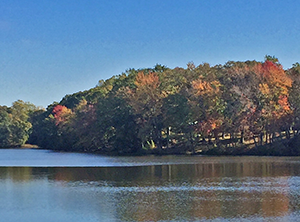 Welcome to the Fall Foliage and Festival Report for the weekend of Nov. 4 – 5, brought to you by the Maryland Department of Natural Resources and Maryland Office of Tourism. In November we’re starting to think of oyster dressing, pumpkin pie and turkey dinners, despite the fairly mild temperatures and presence of still-green leaves on many Maryland trees. While the leaves are past peak and have even started to drop in western Maryland, the brilliant orange, scarlet and yellow foliage is coming on strong in central Maryland and the mid-Eastern Shore. In the central region, reports from Patapsco Valley State Park indicate a colorful scene. For fabulous views of fall foliage, stop by the Valley Overlook in the Hollofield Area near Ellicott City in Howard County. It’s also a perfect time to take in the two-mile scenic drive along Orange Grove Road in the Avalon Area, near Elkridge. With the weather expected to be cool and clear over the next few days, why not enjoy a hike in the park’s McKeldin Area in Marriottsville. Equestrians can enjoy riding at Morgan Run Natural Environment Area, which reports fantastic conditions right now. Located in Carroll County, this relatively undisturbed area has 7 miles of trails running through old farm fields and forests. Baltimore, Carroll and Harford counties are nearing peak, with most understory trees (dogwood, spicebush and sumac) as well as black gum, cherry, hickory, red maple, sassafras, sweet gum and yellow-polar near peak. Sugar maples changed a little and then lost their leaves, which is becoming typical for this season. Although the recent storm accelerated leaf dropping, the Route 1 corridor from Forest Hill to Fallston can compete with anything New England has to offer. The burning bush is flaming and the maples are quite brilliant. Grass is still green making for a colorful contrast. At the top of the Chesapeake Bay, Elk Neck State Park in Cecil County is reporting some beautiful conditions right now, with foliage about 50 percent peak. The park’s sandy beaches, marshlands and heavily-wooded bluffs comprise the peninsula formed by the North East and Elk rivers and the Chesapeake Bay, and several trails meander through the diversified topography, revealing a great variety of plant and animal life. An easy walking trail to the Turkey Point Lighthouse provides a fantastic view. 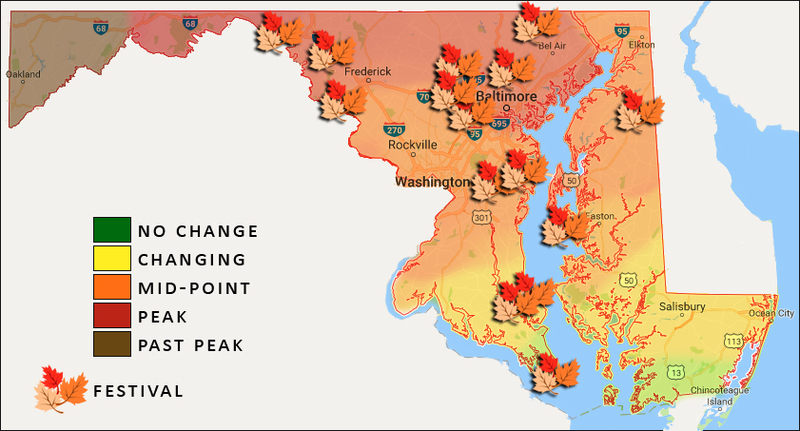 On the upper shore in Kent and Queen Anne’s counties, red maples are still turning orange/red in most areas. Willow oaks are still green as are most of the oaks although some have turned brown. Dogwoods are deep burgundy and starting to lose leaves. Woodland areas are showing some signs of yellow. Wye Mills Lake, photo by Chris Frye. Maryland’s mid-shore is about mid-peak, with oaks just beginning to turn. 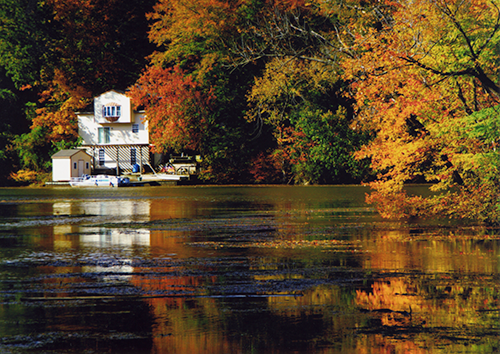 Colors are lovely, in a water-color sort of way, as seen in the photo of Wye Mills Lake. The leaves are just beginning to turn in Wicomico and Worcester counties; however, rain and high wind brought down some of the early color. Montgomery County reports a lot of color change during the past week. Oaks and maples are quite colorful in Prince George’s County as well. Tulip poplars and gums have completely turned color. In Southern Maryland leaves are now starting to turn in Calvert and Charles counties, while St. Mary’s is mostly yellow with some red appearing on the maples. The Cherokee at Fort Frederick will examine the story of these Native Americans who fought on the side of Maryland during the French and Indian War. Visit Fort Frederick State Park between 11 a.m. and 2 p.m. this Saturday or Sunday. This Saturday, from noon to 6 p.m., Boonsboro will host the Interstate Chili, Rib & Wing Fest with net proceeds benefiting Girls, Inc. of Washington County. There will be amateur competitions in chili, ribs and wings (with some pretty serious prizes)! Live music and games for adults and children will be part of the fun. On Sunday at 1 p.m. come out to pay tribute to those who have sacrificed themselves for our country, as well as cheer on those who continue to serve. The 85th Annual Brunswick Veterans Day Parade begins at 1 p.m. at the intersection of East and West Potomac Streets in Frederick County. Eden Mill Nature Center’s Fall Fest this Saturday from 11:30 a.m. to 3 p.m. offers free admission and lots of free activities. 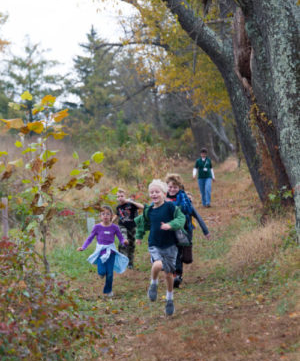 A park-wide scavenger hunt, live animals, honey and beeswax demonstrations, music, mill tours, flying pumpkin catapult, gourd hunt, and much more awaits you in Harford County. Drop in for a day of interactive art activities, dance workshops and gallery tours all inspired by current exhibitions at Towson University Atrium Center for the Arts. Experience the joy of being an artist at Family Arts Day Saturday from noon to 4 p.m. All ages welcome. This Saturday evening from 8 to 10 p.m., join an Owl Prowl at Soldier’s Delight Natural Resource Management Area. Meet an ambassador from the aviary and take a night hike to listen for owls and learn about their biology, conservation, diet and habitat. Learn how to identify trees this Sunday afternoon during a moderate 1-mile Treemendous Tree Hike along the Forest Glen, Pigs Run and Santee Branch trails at the Hilton Nature Center in Patapsco Valley State Park. Looking for something active, fun, and new to get the whole family outside? Join the Howard County Conservancy and Medomak Family Camp for Games in the Meadows Sunday morning. Registration is free! Explore local artisans and crafters who create treasures made from at least 50 percent recycled, organic, fair trade or sustainably-harvested materials at the Trash to Treasure Green Craft Fair Saturday from 10 a.m. to 4 p.m. at Watkins Nature Center in Upper Marlboro. The Eastport vs. Annapolis Tug of War is the “longest international tug of war over water in the world.” The 20th annual battle between the Maritime Republic of Eastport and the city of Annapolis begins Saturday at noon, with the celebration lasting until 6 p.m. This is a not-to-be missed Maryland event! Jefferson Patterson Park and Museum near St. Leonard’s will host American Indian Heritage Day Saturday from 11 a.m. to 4 p.m. Explore a re-created Eastern Woodland Indian village and learn about traditional and contemporary Native American culture. Free admission. On Saturday morning learn about the Greenwell Foundation’s equestrian programs during the Open Barn at Greenwell State Park. Meet horses, watch riding lessons and more. The Lighthouse at Point Lookout will be open to the public for self-guided tours Saturday with volunteers from the Point Lookout Lighthouse Preservation Society on hand for questions. Admission required to enter Point Lookout State Park. On Saturday from 10 a.m. to 3 p.m. the Sudlersville Volunteer Fire House will fill up with trains and toys to benefit the Sudlersville Railroad Museum. See both new and used model trains in all scales, toys and accessories, and operating layouts at the Sudlersville Train & Toy Show. There will be door prizes and food available for purchase. And if you are 21 or older, consider attending Oyster Jam, an oyster and brew festival at the Phillips Wharf Environmental Center on Tilghman Island. Taste farm-raised and wild caught oysters prepared every which way and sample regional craft beers. Begin by taking a walk in your neighborhood or a park and look for acorns. Try to find as many different kinds as you can. 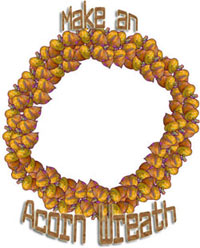 The number of acorns you will need will depend on how big you want your wreath to be. Be sure to leave plenty for the animals.